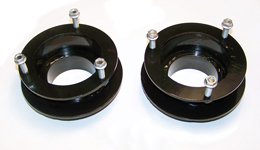 Applications that utilize a coil spring front suspension use coil-spring spacers to achieve lift. In most 4WD applications, this spacer is constructed from laser cut steel and mounts on top of the factory coil. When necessary, shock extensions are also included. With some of the taller lift heights, the amount of lift exceeds the factory rake. This results in a slightly rear-low stance that is popular in some areas. However, for those that want to maintain a level stance, or the traditional rear-high stance, a variety of different block kits and add-a-leaf kits (sold separately) are available to suit every taste or preference.